The year is 1997. Tony Blair and Labour have risen to power in the UK, Tiger Woods has been crowned the youngest ever winner of the US Masters at age 21 and the film Titanic has just been released. It is also the year of Chris Sutton’s first and only England cap, at the age of 24. Not many players with one international cap can say they been an integral part of a Premier League title triumph, Sutton is one of a minority. The reason for Sutton’s lack of international appearances wasn’t down to talent, however, rather his relationship with then England boss Glenn Hoddle. 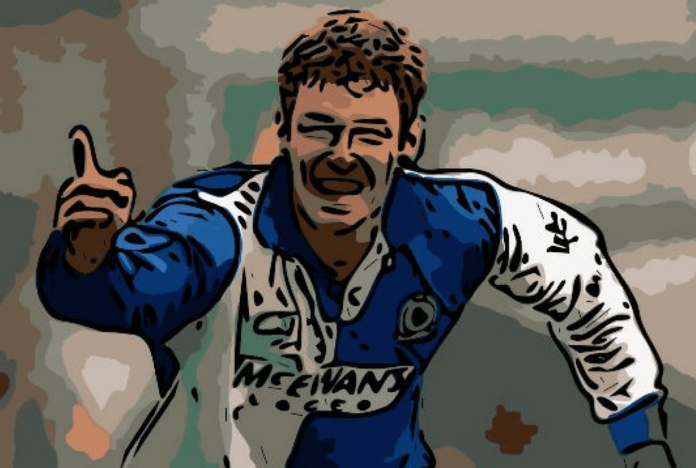 He was in the form of his life at Blackburn, the team he won the Premiership with in 1995, and deservedly earned an England call-up under Hoddle in 1997, the season he won the top-flight Golden Boot. After an 11-minute sub appearance against Cameroon in November, however, Sutton’s international career was over. He was left out of the 22-man squad selected by Hoddle for the 1998 World Cup and was relegated to the B team, refusing to play. Hoddle never picked him for an England squad again, despite a £10 million move to Chelsea in 1999 and a transfer to Celtic in 2000 where he recaptured his goalscoring form. Aged 18 when he broke through to the first team at Norwich, Sutton originally started out his career as a centre back, before manager Dave Stringer recognised his potential as a striker. A then-English record £5m move to Blackburn ensued in 1994, and Sutton became a club legend at Ewood Park. Rovers, taken over by local businessman Jack Walker in 1991, threatened to take English football by storm. Walker wanted to make even Manchester United look “cheap” and spent £25m on players over the next four seasons. His first official involvement with the club was in 1988 when he donated building materials for the new Riverside End, which paid for the marquee signings of Ozzie Ardiles and Steve Archibald. When he took full control, Blackburn were in Division Two, although they were soon promoted to the top flight in the 1992 season. That season coincided with the signing of Alan Shearer from Southampton, Shearer and Sutton going on to form the infamous and lethal ‘SAS’ partnership. In their title-winning season of 1994/95, Rovers were unbeaten until October. Sutton scored a hat-trick in a 4-0 demolition of Coventry City in the fourth game of the season and scored a remarkable 13 goals before Christmas. The big talking point of that season came within a three-day spell in mid-January. Blackburn played title rivals Manchester United on the 22nd, an Eric Cantona goal giving United a crucial three points at Old Trafford. Three days later, Cantona was banned for the rest of the season after kicking Crystal Palace supporter Matthew Simmons. United had already signed a forward earlier in the month, Andy Cole completing a £7m move from Newcastle. Cole made an immediate impact at Old Trafford, scoring five against Ipswich in an incredible 9-1 win and became a key member of a United side which was now making a real push for the title. Between that United game and April, Sutton failed to find the net in the league for Rovers, but he scored a crucial 1st-minute opener against Everton on the first day of that month. Three days later, he scored the only goal of the game against QPR at Loftus Road. Rovers’ form in the last five games of that season was erratic, with Sutton failing to score in any of them, as their grip on the Premier League title loosened. A last day defeat at Liverpool left them needing Harry Redknapp’s West Ham to prevent opponents United from securing all three points. The Hammers had secured their Premier League safety a week earlier, meaning a United win seemed the most likely outcome. However, despite having a host of chances, United could only draw 1-1 at Upton Park, handing Kenny Dalglish and Blackburn the title. Sutton ended the season with 15 goals in 40 games, less than half of Shearer’s Golden Boot winning tally of 34, but both men had a similarly key impact on the title win. Blackburn’s title defence was a disaster for Sutton on a personal level, the forward ending the season with just one goal, coming in the League Cup, in 22 games following a host of injuries. Blackburn and Chelsea’s main man? Shearer and his strike partner for most of the season, Mike Newell, left the club in 1996, giving Sutton a chance to re-establish himself as Blackburn’s key man up front. He did just that, scoring 11 in the 1996/97 and following that return with 18 and the Golden Boot in the 97/98 season. Rovers were in the top three for a large part of the season under Roy Hodgson, but just ten points from their last 33 meant a title challenge faded, and they finished in 6th. The 1998/99 season was calamitous for the club, ending in relegation. Sutton left the club to join Chelsea in a £10 million move, but failed to make an impression, scoring just once in the league that season, and moved north of the border to Celtic in 2000. At Celtic Park, Sutton formed a partnership just like the one he shared with Alan Shearer at Blackburn, this time with Swedish striker Henrik Larsson. Sutton scored twice on his Old Firm debut in a crushing 6-2 win for Celtic, before scoring twice in the 2002 edition of the famous derby. One of his finest moments in a Celtic shirt came against VfB Stuttgart in the 2002/03 UEFA Cup. Already into the quarterfinals of the competition, Celtic had dispatched their German opposition 3-1 in the home leg, but Stuttgart’s away goal meant they were always in with a chance of progressing. Alan Thompson opened the scoring for Celtic on the night, Sutton putting away Celtic’s second, and the goal that sealed the tie, on 15 minutes with a tap-in. Stuttgart replied with three goals and Celtic won the tie 5-4 on aggregate, their second away goal by Sutton the crucial one. Later on in his Celtic career, Sutton often played central midfield and in central defence – the position that he originally played in at Norwich – putting in several solid displays in more unfamiliar territories and allowing the now more fluid striking partnership of John Hartson and Larsson to flourish. Sutton left Celtic in January 2006 on a free transfer, ending his career with Birmingham City and Aston Villa in England and is now a pundit for BT Sport. Not many would have complained had he been able to build a solid international career (except possibly Arsenal fans, who in 1997 had seen Sutton intercept a ball that was being returned to Arsenal after an injury, and score), with a lot of questions remaining about how well Sutton could have done given more chances at the highest level.